It has stood for years, and most recently, it has stood empty. The large home located at 8601 Dixie Highway across from Target and Value City Furniture has become an interesting mystery to me and a few others. There is a discussion of the property going on over at Louisville History & Issues and the blog a pretty pickle has a few photos of the place, one of which is featured to the left. I am interested in any facts you may have concerning the home. I know it had been divided into apartments some time ago and that it is currently boarded up, which may possibly indicate foreclosure. It is an intriguing structure, and it's location may indicate some type of historical significance. 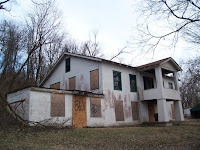 We must not allow the home to suffer the same terrible fate as that of the Nine Mile House, which was unceremoniously (and probably illegally) torn down several years ago. If you have any information on the home, please let me know by sending an email or by contributing to one of the discussion threads on the above mentioned websites. Thanks. I've been fascinated by that house my whole life. I do hope it's not slated for demolition. It intrigues me; I wonder why it was built there- did it precede the train tracks that cut it off from the road? I don't have any real facts but as a kid, I delivered Christmas food there from my school. Even then, sometime around 1970, I remember it being very run down inside. I cannot find the website now but will look for it when I get back to work but it seems that I read that the house was built as part of Waverly Hills. It was the head doctors house. I may be wrong but will post when I find the website again.